Starting in January, esoteric lecturer Ken Rees is running a series of evening classes in London on The Mystery Traditions: Past and Present. Alongside the developing mainstream religion of Christianity and its early competitors, the Gnostics, there were a variety of alternative options available both within philosophy and esoteric spirituality. This course traces some of these currents noting the geographical spread of the various Mystery Traditions and the time periods during which they were popular. Examples will include the Eleusinian Mysteries of classical Greece together with their Dionysian/Bacchic counterparts. The importance of the Orphic tradition is also noted as is the significance of Egypt, particularly the mysteries of the goddess Isis. Nor will be the path of the warrior, Mithraism, be ignored. We raise the question - did the early British themselves have mysteries? - And look at earlier romantic understandings of the place of the ancient Druids in this context. Key issues to be discussed include what actually happened in these often secretive enclaves?What were the traditions’ fates and why did they die out? Plus the course will look at the vital importance of initiation and rebirth in facilitating ways for achieving transformation and a hoped for immortality. Thus we will assess the value of the early mystery tradition ethos for both the surrounding culture and for the individual. You can learn about the Mystery Traditions at the six-week course on Tuesdays evenings from 8pm to 10pm, starting on 8 January and running until 12 February. Fees are £47, or £16 for concessions. The picture shows Demeter and Persephone celebrating the Eleusinian Mysteries. 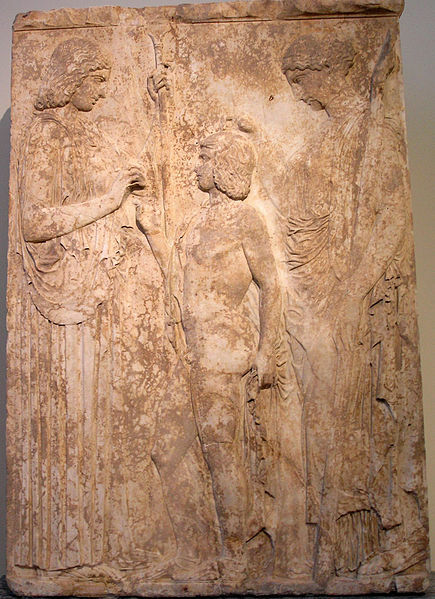 On the left Demeter, wearing the peplos and holding a sceptre in her left hand, presents Triptolemus with sheaves of wheat, for him to give them to humanity. On the right Persephone, wearing the chiton and a cloak and holding a torch, blesses Triptolemus with her left hand. Votive relief. It is from the National Archaeological Museum, Athens.